And the Cheesecake Bake-off Winner is . . .
Lisa was James’ production assistant on Jon Robin Baitz’s “Chinese Friends” that premiered at Playwright’s Horizons in 2004. Lisa has gone on to fame and fortune as the Executive Pastry Chef and Founder of The Chocolate Swirl. (You HAVE to check our her website, or her shop if you’re lucky enough to live in Queens! There’s an Iphone birthday cake on the site that is absolutely remarkable!) 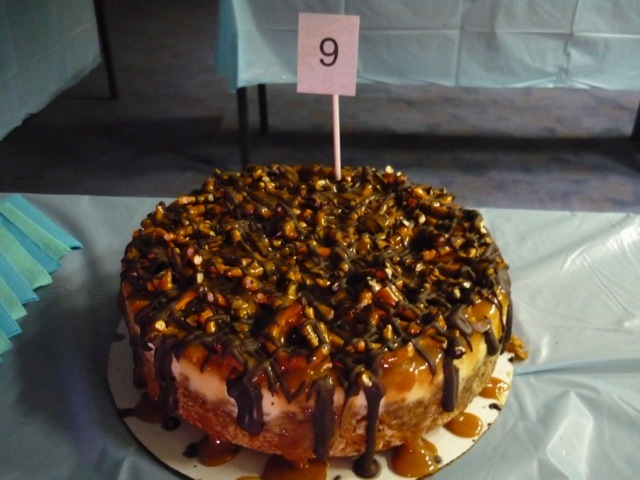 So, I guess she was a bit of a ringer, but with a cake of such delicious decadence, who’s going to complain? 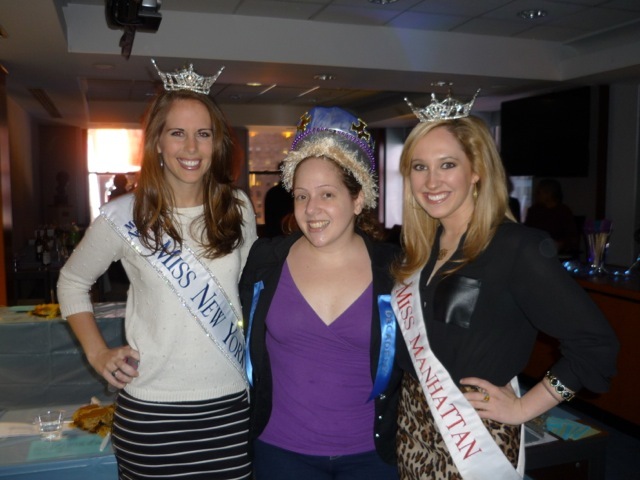 The cheesecake awards were handed out by Shannon Oliver, the current Miss New York, and Katie Berry, the current Miss Manhattan. James just knows everyone, doesn’t he? The event raised $700 for Broadway Cares/Equity Fights AIDS. A total of 13 cheesecakes were baked and over 60 people attended. We’ll be posting selected recipes over the next few weeks. Preheat oven to 350 degrees F. Grease the inside of a 9 inch spring form pan with butter. Lay two large pieces of aluminum foil crosswise on your work surface. Place the cake pan in the middle and crimp the aluminum around the pan. Stir the crust ingredients together in a medium bowl. Once fully incorporated press into the bottom and sides of the prepared spring form pan, creating an even layer. Melt the chocolate over a double boiler or in the microwave. Pour over the prepared pretzel crust. Transfer the spring form pan to the refrigerator for 5 minutes or until chocolate has set. Whip together the cream cheese and sugar until fluffy. Add the sour cream, eggs, egg yolk, vanilla and salt and stir together until incorporated.Pour the filling over the prepared crust and chocolate layer. 4. Transfer the cake to a roasting pan and carefully fill the roasting pan with warm water until it comes 1/3 of the way up the sides of the spring form pan. Bake in the preheated oven for 50 to 60 minutes or until the center only jiggles slightly. Remove and allow to cool on a wire rack for 20 minutes. Remove cheesecake from Springform pan. Crush up pretzels and put them on top of cheesecake. Melt the unwrapped caramels in a microwave safe bowl in 30 second intervals. CAREFUL! IT WILL BE HOT. Once melted add 3-5 tabl spoons of heavy cream and mix well. If it is still sticky put it back in microwave. Pour evenly over pretzels and let it drip down sides. ← Get Ready for James’ Annual Cheesecake Bakeoff!